WHITEHALL DOG RESCUE WOULD LIKE TO INTRODUCE YOU TO 5 SPECIAL PEOPLE WHO KINDLY AGREED TO BE PATRONS OF THE RESCUE. WE WOULD LIKE TO GIVE A BIG THANK YOU FOR THEIR HELP AND SUPPORT. We are delighted to have Jan on board with Whitehall and look forward to many future events with her. Jack Dunn is a Councillor for the city of Leeds. He is a devout animal lover and has supported Whitehall for many years. Jack supported Brian throughout the early trials and tribulations of the Rescue and it could be said that with out his support Whitehall would now not exist and many hundreds of dogs lives would not be saved. We would like to say a huge thank you to Jack for his continued support and that we are proud to call him a friend of Whitehall. 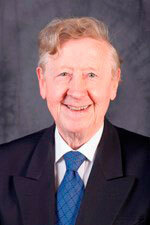 Bernard Atha is a Councillor for Kirkstall in the city of Leeds. He has worked tirelessly with Whitehall for many years being a constant support and advisor throughout difficult times. Like Jack Dunn, Whitehall would not exist now without Bernards support. We look forward to working with Bernard in the future and are proud to have his name associated with our Rescue. BBC Look North Presenter Nicola Rees first came to Whitehall Dog Rescue when she worked as a reporter for BBC Radio Leeds and on many occassions would report on our Rescue work and also on the BBC Inside Out programme when Nicola and crew spent several days working with Brian filming the day to day work at Whitehall including Brian collecting Dogs from the Dog Compound on the day they were due to be destroyed. 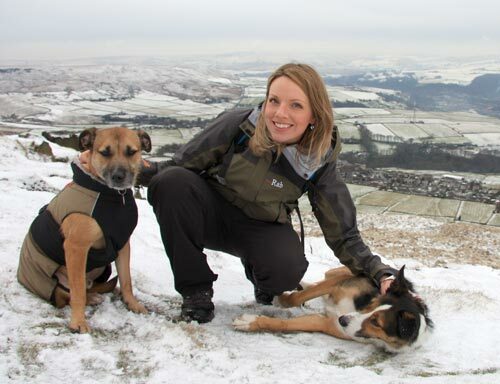 We are Proud to have Nicola as a good friend and patron of our Rescue. BBC Radio Leeds Presenter, Associate Principal Lecturer Leeds Trinity University. Bob first came to Whitehall With Nicola his wife (see above) to volunteer at the rescue but Bob and Brian had spoken on many occassions when Bob was presenting his BBC Radio Leeds programme and he kindly started doing a weekly feature called "Dogs Tales" on his Radio Show featuring a "Rescue Dog Of The Week". This resulted in Whitehall Re-homing a number of Dog's to listeners of Bobs Radio Show. Bob is a great animal lover and even kept on smiling when "Big Monty" one of our Giant Rescue Dogs dragged him into a pond right up to the waist on a freezing cold day. (Big Monty Loved it). 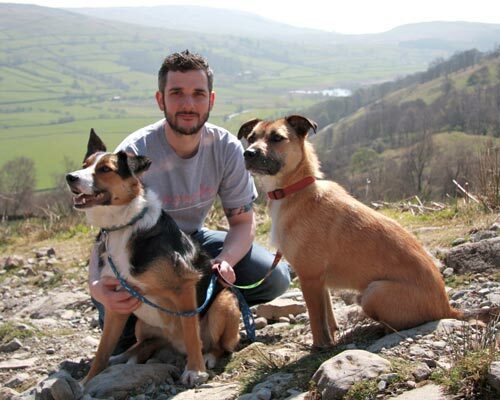 Bob is pictured with Blue (left) and Ralph (right) two of our former rescued Dogs that came into us with life threatening injuries. We are proud to call Bob our friend and to have him as a patron to the Rescue.